The Muskoka Region has always been the countries go to destination for cottage life. Over the last decade this stunning area of approximately 4,000 square kilometers, surrounded by numerous lakes, rivers and communities has carried on its legacy as Canada’s premiere Cottage Country. The breathtaking region of Muskoka is encompassed by three large freshwater lakes – Rosseau, Joseph and Muskoka – with Canadian Shield granite surrounding to enhance the miraculous beauty of the Muskoka region. Touted for its enormous cottages and illustrious living, Muskoka is, without a doubt, the epicentre of Canada’s cottage and recreational living. With approximately 1,600 lakes, there is most certainly a home or cottage for anyone looking to live on the water and enjoy the solitude of country living with only a short 90 minute drive north to Toronto. If you`re searching for serenity, the Muskoka region is where you are certain to find it. From the deepest of the three large lakes, Lake Joseph, the tranquil shores of Lake Muskoka and the serene qualities of Lake Rosseau, the Muskoka region embodies stylish cottage living as well as vibrant living, for permanent residents and cottagers alike. Gravenhurst, Huntsville and Bracebridge are the largest of the communities in the area with populations all exceeding 10,000 and growing consistently. Huntsville has the largest population of the three, hovering just under 20,000 permanent residents. During the spring, summer and fall, the influx of cottagers and tourists transforms this already boisterous region into the ‘place to be’. Then, of course, there is the lake the region is named after: Lake Muskoka. Teeming with glistening waters and pristine sunsets, Lake Muskoka offers up some of the best boating, fishing and most importantly, rest and relaxation, in the country. Aside from the larger communities and lakes, there is a multitude of villages, towns and smaller, more inviting lakes, for those who prefer to keep their cottage life on the discreet side of things. 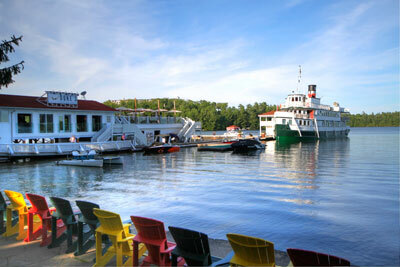 Bala is an intriguing small town located in the western part of the Muskoka region. Known for its abundance of cranberries and simplistic appeal, Bala is another haven that cottagers have been flocking to for years and will be for years to come. With over 1,600 freshwater lakes in the region, the Muskoka district has everything that a connoisseur of life yearns for; the illustrious homes and cottages that make up this region are just the beginning. Having all of the amenities a car or boat ride away is always a plus; however, for those of us who prefer the harmonious feeling of solitude and tranquility, the awe inspiring natural landscapes, thunderous waterfalls and lush forests, make the Muskoka region the obvious choice for your life of grandeur.